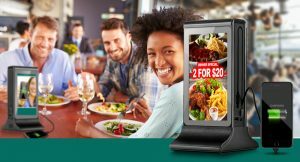 OneStone, a technology leader in providing Consumer Advertising Mobile Charging Stations that display beautiful HD advertising while allowing the public to charge their mobile devices will be at the National Restaurant Association Show in Chicago! 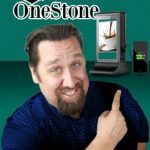 Rated one of the “5 Biggest Bar Trends” at the NightClub&Bar Show 2018 by the Las Vegas Review Journal, OneStone Hubs are a next generation, digital table tent that have built in phone charging cables (Micro usb, Type C & Apple) for 99% of all phone types and enough power to charge 40+ phones a day from their high capacity internal batteries, so no wiring, and simply recharge at night. They are even Wifi controlled so you can manage the graphics from corporate office and change your digital graphics on the dual sided High Definition Displays as often as you want. 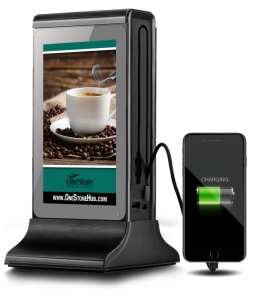 About the OneStone Hub – The Worlds Best Digital Table Tent, Advertising Mobile Phone Charging Unit. The beautiful designed small footprint Table Top unit houses dual high definition displays allowing you place the units anywhere you like. 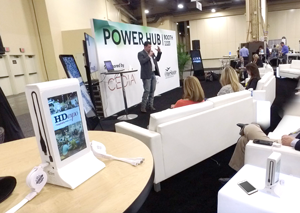 Utilizing their internal high capacity batteries, the units can run the displays and charge upwards of 40+ phones a day without being wired to an outlet. You simply re-charge them quickly overnight and place them anywhere you like each day. With a cloud based content management system, you change advertising as often as you like via Wifi from anywhere in the world. The Advertising Network – The OneStone Hubs distribution in restaurants, hotels, cafés, coffee houses, bowling alleys, salons and more, allow for a wide-spread and ever-growing advertising network potential for advertisers seeking localized and national advertising directly to the public in a digital table top hub. The OneStone proprietary Ad Buy Structure means you Only pay for Guaranteed Seen Ad Time! You can choose your Target Venues and work with small or large budgets. Contact us if you are interested in Advertising on OneStone Hub, Hosting OneStone Hubs in your Venue or even becoming a OneStone Rep.